The water is cold! My swimsuit is too tight! It is too loud! The water hurts! whether it be at a pool, lake or ocean, and learning to swim, is considered a right of passage. The activity provides an array of learning experiences, including gross motor skills, balance, core strength, endurance, sensory processing opportunities and social interactions. However, with the many sensory demands that are involved in swimming, the task can become overwhelming for some children. Below is information regarding the many sensory systems that require integration within the brain while participating in a swim lesson. Swimming can be both challenging and fun, but know your child’s limits as well. Continued exposure in a controlled and safe environment can help to establish safe and error-free learning along with confidence! Children with tactile defensiveness or hypersensitivity will avoid, become fearful of, or bothered by various, every-day touch experiences that typically would not cause alarm or issues for others. Their avoidance of tactile experiences and lack of engagement in tactile play ultimately limits their learning experiences and development of gross and fine motor skills. Tactile defensiveness and hypersensitivity happens because the nervous system is not interpreting touch sensations and stimulation accurately, resulting in a child responding with fear, avoidance, withdrawal, or acting out with a “fight-or-flight” response. Your child is not acting this way to intentionally make life difficult for your family. Don’t get upset, blame your child, or punish your child, but advocate for your child’s difficulties, and help them get the treatment and accommodations they need! 5. Administer deep pressure when a child is irritated by texture… Practice deep pressure often. “Deep pressure” refers to a type of touch that may help to desensitize your child’s tactile experience. This could include massage, a “bear hug” or wrapping your child snugly in a blanket. 6. Wearing spandex or lycra clothes under regular clothing has a calming effect because deep pressure is distributed over the body/limbs. 7. Engage in play with undesirable textures for short periods of time and in a non threatening way. Try to slowly increase the time that it is tolerated. For example, shaving cream, glue, sand, dry rice, etc. 8. Keep crunchy foods on hand for your sensory-sensitive child, as these foods facilitate an important “sixth sense” called proprioception, which allows a person to accurately perceive body awareness, movement and body position. Crunchy foods may help your child to develop better proprioception. 9. Separate textures during meals. It may help to avoid mixing foods together that have conflicting textures, such as mashed potatoes and gravy. 11. An Occupational Therapist (OT) may guide you in administering the Wilbarger Brushing Protocol, which has the purpose of decreasing tactile sensitivities. 12. A child with tactile defensiveness and sensitivity needs to be in Occupational Therapy. Tactile hypersensitivity and defensiveness will not go away on its own! 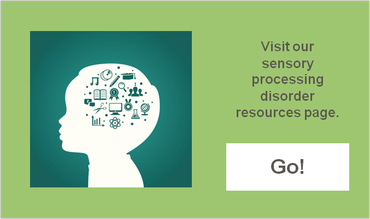 Tactile sensitivity is often part of a larger problem, called Sensory Processing Disorder. An occupational therapist can help your child decrease sensory sensitivities and improve overall sensory processing for improved daily functioning in all areas. It is an OT’s goal to introduce tactile experiences slowly and gradually as the child is ready to experience them, so this defensive/aversive reaction is avoided! In order to achieve proper developmental milestones and develop social skills, these children need to have the underlying sensory defensiveness addressed.